Our philosophically-minded panel is here to (try to!) answer your questions about God, existence, religion, spirituality, the afterlife, and more. In this episode, host Curtis Childs and featured guests provide insights into questions from viewers with the help of eighteenth-century philosopher Emanuel Swedenborg’s spiritual writings. Throughout this episode, the expert panel works together to answer questions from viewers—questions and answers are summarized below, but follow the links for the full discussion. 1. Why am I and the world in general just now hearing about Swedenborg and his work? According to Jonathan Rose, Swedenborg is one of “the most influential unknown persons.” He was quite popular within his lifetime and shortly after, but many of his ideas were rolled in with other philosophies or spiritual movements. Then, as the twentieth century became more secular and materialistic, there was also a turning away from religion in general. In many ways, he was too mystical for philosophers, too critical for Christianity, and too spiritual for the mainstream. Now, thanks partly to the Internet, he’s resonating in a new conversation around spirituality. 2. 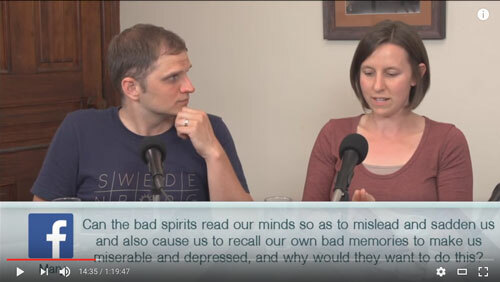 Can bad spirits read our minds and make us miserable? Why would they do this? Swedenborg wrote that evil spirits target the love and hope within us and that they do this with false ideas and feelings of anger or hopelessness. They may be the spirits of people who don’t like other people very much, or they may even be negative spirits that single out people with a very spiritual consciousness. In a lot of cases, the lies they’re telling you are based on negative memories that they find in your head and want to explore. It’s important to remember, however, not to identify yourself with the negative thoughts or depressed feelings that might arise—by rejecting them, you can rise above these destructive thoughts and feelings. 3. What are your thoughts about spirit communication? The answer can depend on how you define spirit communication, because, as Chelsea points out, in a sense Swedenborg describes everything that happens in our mind and inner self as one extended spirit communication that happens in feelings and impulses rather than in words. One thing to remember about spirit communication is that spirits are like people—there are all kinds of them, with a wide range of intentions. 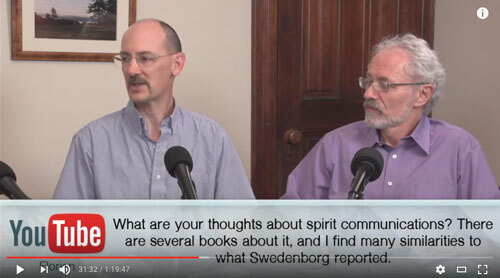 If you’re not careful and clear about what you’re seeking, it’s quite possible to get in trouble with the spirits you contact, which is why Swedenborg cautions strongly against attempting that type of communication. But if you are in that situation, you can sometimes judge what kind of spiritual communication you’re having based on the feeling you get. 4. What does Swedenborg say about suicide? Swedenborg does not talk about suicide that often, but he would not agree with doctrines that say suicides go to hell by default. Your place in the afterlife is not determined by one action, but by how you’ve lived your life and whether love guides you. As a scientist, he would also understand that chemical imbalance can be responsible for suicidal thoughts. 5. Why doesn’t God allow himself to be known to us? 6. Are there women and children angels? The Bible talks about strong men that were angels, not women. Yes. In Swedenborg’s view, all angels were once people. That means all kinds of people become angels. In fact, Swedenborg wrote that all children who die under a certain age become angels—they grow to become wise adults in heaven. 7. I have Asperger’s, a kind of autism. Would I still have it in the spiritual world? How would that affect me? Swedenborg doesn’t answer this question directly, but Jonathan points out that it’s a tricky question because autism affects a person’s personality, in some ways for the better. He believes that the pieces of you that make you who you are will remain, while anything that you feel is limiting will be removed. Dan points out that we all have incredible depths to our personality that often don’t get expressed in this world. But often the ways we do express ourselves are what make us most useful. Heaven, like the physical world, needs all kinds of people to function properly, but any limitations and struggles will be removed. Through our time in this world, we refine who we are and who we aren’t. 8. What does it mean if you’ve seen and felt your silver cord? The silver cord is a bond between body and spirit that is often seen in near-death experiences. Swedenborg describes a type of force that draws us to our spiritual home in the afterlife but not anything that connects us to our body. 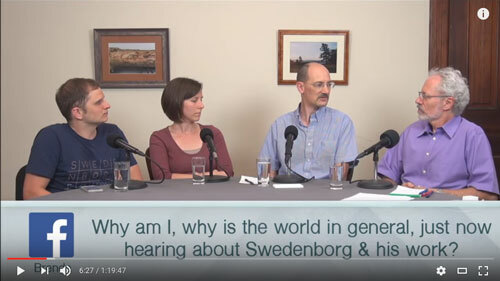 While many of the panelists are only loosely aware of the silver cord phenomenon, they comment on how important the connection between the spiritual and physical world is in Swedenborg’s writings.